The Solid Color Studio Yoga Blanket with tassels is more than just a yoga prop! These blankets are great for restorative yoga, meditation, blankets, or to lend support for yoga positions when a bolster is too large.. The Yoga Blanket can be used for more than a yoga blanket; blankets can be used as picnic blanket, beach blanket, and more! 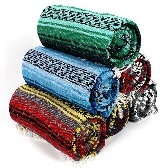 These Solid color yoga blankets are available in a verity of colors, they can be easily machine washed. Mexican Yoga Blankets will hold their color, and will not fade in the washing machine or in the sun.